With a Dividend Safety Score of 98, Simply Safe Dividends gives Medtronic’s dividend a “very safe” ranking. While long-term income investors should rest assured that their dividend is secure, those looking for safe, high income will likely take pause with the stock’s 2.2% yield. 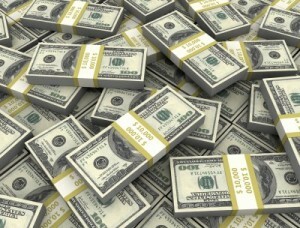 After all, a $1 million portfolio would only pay $22,000 a year. Yes, your income should go up each each year — Medtronic is a fantastic dividend grower — but because you’re starting with such a low entry yield it will take a decade before you’re generating meaningful yield-on-cost. If only there was a way to capitalize on Medtronic’s extremely safe dividend AND collect higher income to boot today. 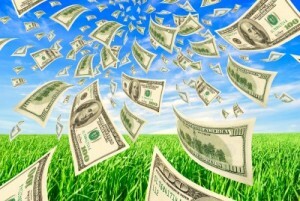 In fact, it’s possible to collect more than four times that income in a matter of seconds. 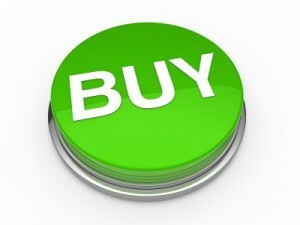 Plus, the strategy I have in mind is designed to be safer than buying stock the “traditional” way. 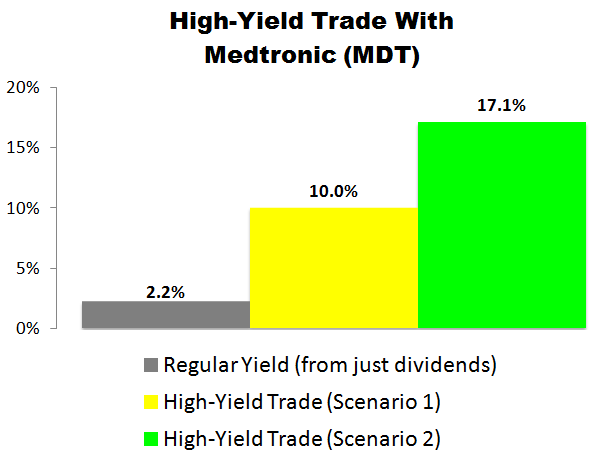 In fact, I just made one of these high-yield trades with Medtronic this morning… and I’m generating a 10.0% to 17.1% annualized yield. With all of this in mind, the following setup is what we’re looking at as we go to press. It’s the same high-yield trade I made in my retirement account just minutes ago, shortly after opening bell. As we go to press, MDT is selling for around $83.57 per share and the March 16, 2018 $85 calls are going for about $2.02 per share. By selling a call option, we’re giving the buyer of the option the right, but not the obligation, to purchase our 100 shares at $85.00 per share (the “strike” price) anytime before March 16, 2018 (the contract “expiration” date). In exchange for that opportunity, the buyer of the option is paying us $2.02 per share (the “premium”). Because we’re collecting immediate income when we open the trade, we’re lowering our cost basis on the shares we’re buying from $83.57 to $81.55. In other words, we’re buying the stock at a 2.4% discount to its current price. If MDT stays under $85 by Mach 16, our options contract will expire and we’ll get to keep our 100 shares. 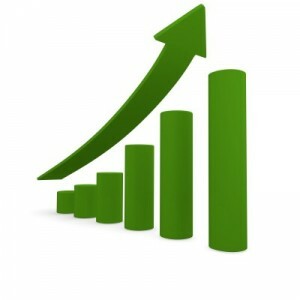 In the process, we’ll receive $202 in income ($2.02 x 100 shares). Excluding commissions, if “Scenario 1″ plays out, we’d receive a 2.4% yield for selling the covered call ($2.02 / $83.57) in 88 days. That works out to a 10.0% annualized yield. If MDT climbs over $85 by March 16, our 100 shares will get sold (“called away”) at $85 per share. In “Scenario 2” — like “Scenario 1” — we’ll collect an instant $202 in income ($2.02 x 100 shares) when the trade opens. We’ll also receive $143 in capital gains (1.43 x 100) when the trade closes because we’ll be buying 100 shares at $83.57 and selling them at $85. Still, in this scenario, excluding any commissions, we’d be looking at a $345 profit. From a percentage standpoint, this scenario would deliver an instant 2.4% yield for selling the covered call ($2.02 / $83.57) and a 1.7% return from capital gains ($1.43 / $83.57). At the end of the day, we’d be looking at a 4.1% total return in 88 days, which works out to a 17.1% annualized yield from MDT. We’d place a “Buy-Write” options order with a Net Debit price of as close to $81.55 ($83.57 – $2.02) as we can get — the lower the better. Options contracts work in 100-share blocks, so we’d have to buy at least 100 shares of Medtronic plc (MDT) for this trade. For every 100 shares we’d buy, we’d “Sell to Open” one options contract using a limit order. Accounting for the $202 in premium we’d collect for selling one contract, that would require a minimum investment of $8,155.